(L-R): Papua New Guinea's Maurie Wasi with Cook Islands Football Association Technical Director Jess Ibrom. 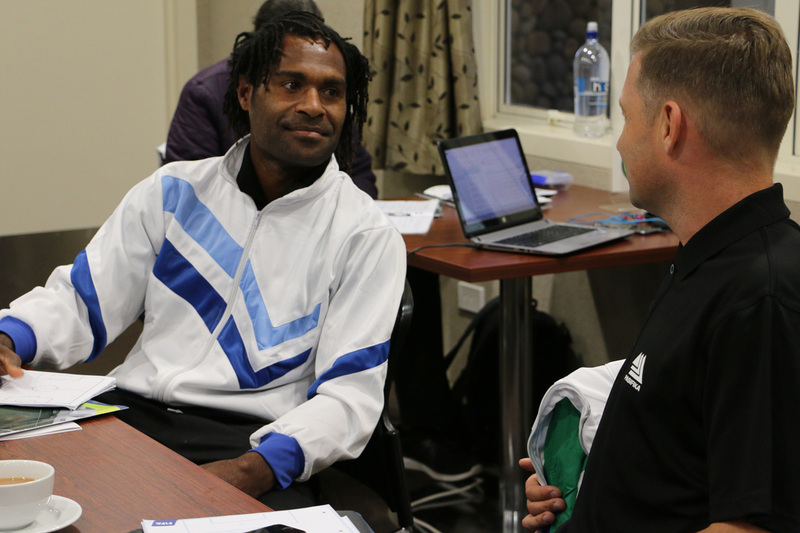 Joining football leaders from across the region, former Papua New Guinea international Maurie Wasi is gaining deeper insight into how to give back to the game during this week’s OFC Education and Training Seminar in Auckland, New Zealand. “It’s been a really good learning process for me. I’ve never seen or experienced so much knowledge in one room before,” he said. After making the move to New Zealand 12 years ago, Wasi has been involved in football both as a player and a coach, but as his knowledge for game has developed, the latter has become his new passion. “I’ve been playing but also involved in coaching for the last six years and I’ve been really getting in to it. I’m really enjoying coaching so I want to see if I can go far with that and if I’m good enough,” he said. Although he’s no longer taking the field for Papua New Guinea, Wasi hopes his new pursuit will, one day, see him make a return to the Kapuls in a new role. “I played for the national team for 14 years and I really enjoyed my time but now I want use my experience to help my country,” he said. “Ultimately I want to see if I’m good enough to coach the national team one day, but there’s lots for me to learn still. Wasi is more eager than ever to contribute to his country’s football development after witnessing the recent achievements that have resulted from the Papua New Guinea football community’s hard work and determination. “I’ve been in the game for a very long time and in my time we’ve never come this far,” he said. Wasi has also been inspired by the achievements being made by Danish coach Flemming Serritslev. “In the last round of qualifiers our national team did very well and I give credit to the coach. In the past, coaches have come in and it’s been too structural. We haven’t been taught things as kids growing up to really be able to grasp it within the short amount of time that they’ve spent. “With Flemming coming in I think, personally, he’s simplified our football to suit us and we’re getting results. We’ve just got to build on that and not take anything for granted. We’ve got to keep going forward. With three days left in the OFC Education and Training Seminar, Wasi has his focus set on contributing to the further development of Papua New Guinea football. “I’d just like to thank OFC and PNGFA for letting me come to this. It’s been a good start for me to understand things before I’m given a chance in a coaching role and hopefully I take whatever I learn here and try and do something with it.